The right setup can influence your experience. Ah, the stationary bike. At first glance, it might not seem that effective; after all, you don't get the uphill climbs and downhill sprints to vary your workout like when riding a real bike. But stationary bikes can be instrumental in torching calories and training in the off-season, so they're worth a second look. 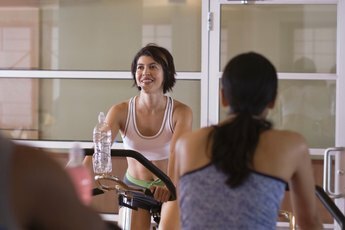 Whether you're taking a spin class with friends or you're going for a spin on your own time, the right technique and prep means you'll get the most out of your workout. 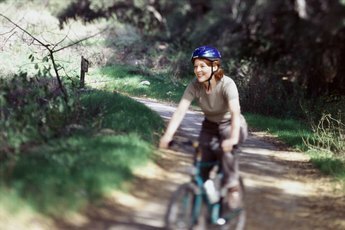 The first thing you'll need to do before you hop on and start pedaling is to adjust your bike. Most stationary bikes use dials to adjust the seats and handlebars up and down to your comfort level. The seat should be high enough that when you hit your down stroke and your lower pedal is at its lowest point, your knee is nearly straight with only a slight bend. When standing beside the bike, that should put the seat level with your hip. The handlebars should be adjusted so you can maintain a straight back -- no hunching whatsoever. It may take a few classes or rides for you to pinpoint your personal settings. When you first start pedaling, you should feel comfortable on your stationary bike. While your back should remain straight, it's OK to lean forward to increase intensity but only if you can maintain perfect posture with a flat back. You should never be pedaling so hard that you bounce around in the seat. Instead, proper form means smooth, even strokes and control over your body. When taking a spin class, you might be tempted to amp up the intensity to keep up with the instructor and class pros. 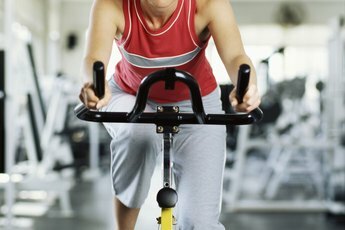 But while stationary bikes can be beneficial for your fitness routine, they can become dangerous when used improperly. Make sure you maintain a comfortable level of intensity during your workout. Here's a test you can try; if you're too winded to talk to your neighbor, you're pedaling too hard. Focus on increasing your aerobic fitness and over time, you'll be able to increase your intensity as well. Stationary bikes aren't just for the occasional cardio workout. During a spin class, you'll also experience muscle toning, thanks to exercises that use the bike and your posture. Stationary bikes are also ideal for cycling training during the off season. While you might not be able to practice a route, you can still work on perfecting your pedaling or increasing endurance, making the stationary bike a great all-around piece of equipment.